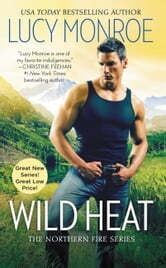 Wild Heat is the first book in Lucy Monroe's new series Northern Fire. This first book follows Kitty Grant returning to her hometown of Cailkirn, Alaska after her years away had caused her nothing but pain. As a college student Kitty had moved away to go to college with her best friend Tack, but after meeting the wrong man, things go down hill pretty fast. Tack MacKinnon had followed her out of Alaska, a man secretly in love with his best friend, but returned home after Kitty betrayed their close friendship and married another man. If you enjoy small town romances where everyone knows everyone else's business and family members look out for each other in a tight knit community, then you'll enjoy Wild Heat. Kitty and Tack are both likeable characters, and they share an easy chemistry. Wild Heat may be a sweet, small town romance, but it's not lacking in steamy scenes at all. Even though Tack is nursing some major hurt caused by Kitty tossing their friendship away all those years ago, I love how right away his first instinct is to help her when he learns of the downward turn her life has taken. He jumps right in and figures out how he can help her and even better understand her issues. That he would take the time to learn about her eating disorder was a really special thing. There are also some scenes featuring a secondary romance that starts as a mail order bride situation. I really wanted to know more about these two! It looks like their story will be told in book three (although it would make more sense to me to see them in book two). Either way, it will be interesting to see where the series goes next. I received a copy of this book from the author/publisher in exchange for an honest review.